Now you get bookmarklet for Feedly as well. Amit Agarwal from Labnol has created a bookmarklet for Feedly. To use this feedly bookmarklet, just drag the “Add to Feedly” and drop it to your browser bookmark bar. How to use Feedly Bookmarklet? 4. It will take you to the Feedly subscription page. 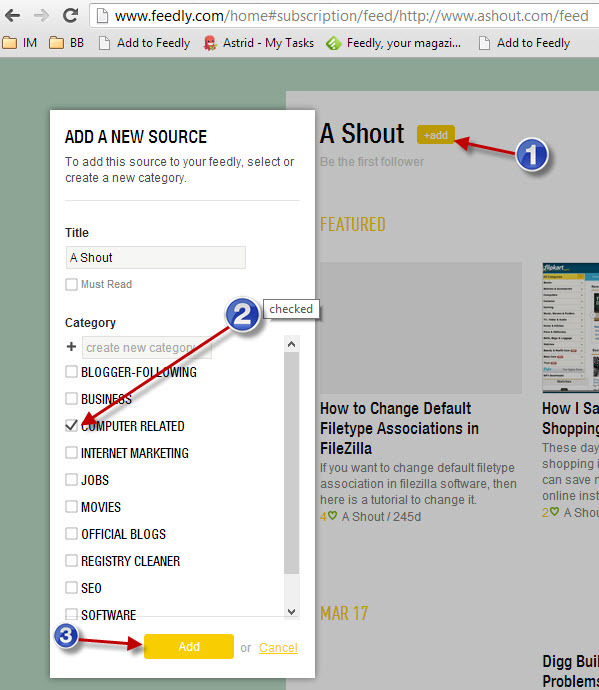 Now in that page click on “+add” button and select the category you want to put that site, and then click Add button. That’s it. Now you have subscribed to that blog on Feedly.